Though an ear infection is more frequently diagnosed in children, it is also common in adults. Know the type of infection you have and get treatments early. The ear is one of the most sensitive body parts. This sensory organ should be cared properly to avoid various problems, such as an ear infection. An ear infection is a common condition. Even though it is more frequently diagnosed in children, it is also common in adults. The ear consists of the three main parts: outer ear, middle ear and inner ear. Sound waves reach the outer ear first, then middle ear and then travel to the inner ear. A number of conditions can influence your hearing and ear infections are the most frequent. The majority of ear infections are the outer ear infection (otitis externa), but the middle ear infection (otitis media) can also occur . Outer ear infections are also known as swimmer's ear, because it is a common swimmer's problem. Swimmer's ear is an infection in the outer canal of the ear. It happens when contaminated water gets into the outer ear letting germs to grow and develop because of the moist, warm conditions. Middle ear infection is most often a viral or bacterial infection that affects the air-filled space behind the eardrum, containing small vibrating bones of the ear. 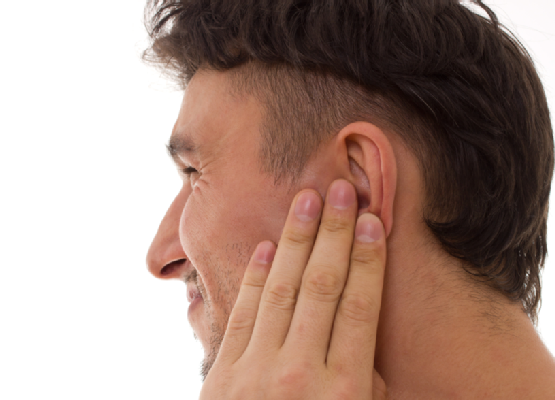 When bacteria or fluid gets trapped inside the ear, an infection might occur. See your doctor if you are suffering from any of the swimmer's ear symptoms, even if they are not severe. Visit the emergency room or call your doctor urgently if you have fever and severe pain. See your doctor if you are suffering from the severe ear pain, discharge of fluid or blood, or your symptoms last for more than one day. Ear drops: Doctors usually recommend ear drops that have a particular combination of the ingredients, such as steroid, antibiotic,antifungal medications or acidic solution, depending on the severity and the type of the infection. OTC pain relievers: Your doctor might also prescribe OTC pain relievers, such as naproxen (also known as Aleve, Anaprox or others), Ibuprofen (Motrin, Advil, others), or Acetaminophen (Tylenol, Paracetamol, others). If you are experiencing severe pain, your doctor may recommend stronger pain reliever. Ear drops: Similarly as in the case of the outer ear infections, your doctor may prescribe you some ear drops like Aurodex (antipyrine-benzocaine-glycerin). They serve as additional pain reliever in case your ear drums are not perforated. Do not use higher dose of benzocaine than the prescribed dose without consulting with your doctor first. OTC pain relievers: Your doctor might recommend pain relievers, such as Ibuprofen or Acetaminophen to ease your pain. Use medications as prescribed by doctor. Surgery: In case the ear infection is not getting cured by usual medications, your doctor might consider ear tubes (Tympanostomy). During this treatment, a small tube is inserted into the eardrum, leaving a small hole open that lets air to get in, allowing fluid to drain easier. This procedure is done under general anesthesia. If you suffer from enlarged adenoids, your doctor may recommend removing them, especially if they cause ear infections. Combine 1 part of white vinegar and 1 part of rubbing alcohol, pour 1 teaspoon of mixture into affected ear and let it drain back out. This solution can prevent the growth of bacteria and help to promote drying. Warm compress: Place a warm compress over the affected ear to reduce the pain in the ear. That can be a warm bottle of water or a moist washcloth. Salt: Salt is one of the most effective home remedies. Heat one cup of salt in the microwave for around 5-6 minutes. Once it is done, place the hot salt into a sock or glove. Tie the open end of the sock or the glove utilizing a rubber band. Lie down and put the remedy under the infected ear for around 10-15 minutes. The heat from the hot salt will help to drain out the fluid from your ear. Apple cider vinegar: Apple cider vinegar is helpful in treating fungal ear infection. Mix 1 part of water and 1 part of vinegar, take a cotton ball and soak it in the mixture. Place the cotton ball in the infected ear for around 5 minutes. Repeat the procedure few times a day. Do not swim in contaminated water and always use ear plugs while swimming. Make sure your ears are dry and clean. Dry your outer ear only, gently wipe it with a soft fabric. Turn your head to the side and drain the water from your ear canal. Wash your hands every time you touch your ears. Avoid ear irritation. Place cotton balls into your ears when using hair dryer or hair spray. Avoid scratching your ears with nails, cotton swabs, paper clips or hairpins. Quit smoking and secondhand smoking. Treat colds, allergies or sinusitis. Take a decongestant if you have a cold or before an air travel. Do not place any foreign objects in your ears. Wash your hands regularly, do not go out when you are sick and avoid getting germs from others.